I was rushing out of my house on a Thursday afternoon and my phone fell squarely onto the pavement. As I picked it up and gingerly turned it over in my hands, I gasped. 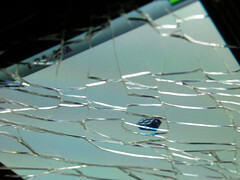 The screen was cracked, utterly and completely. It was a moment so steeped in idiocy that I almost laughed at myself. If you drop a phone it breaks, right? Except that it hadn’t and I’d dropped it a million times before. Maybe this was just its time to die its little death or maybe this was a particularly horrible fall. Whatever it was, it happened and it was over. Helpful Girl: So if you’re phone is backed up, I’ll delete everything on it and get you started with a new one. HG: Ok, is it backed up to the cloud? HG: (concern on her face) What did you do to back it up? Me: My husband plugged it into the computer and made a copy.